The Delicious Pairing of Wine and Cheese Explained - Australian Wine Tour Co. When we think of wine, cheese generally comes to mind, and vice versa. For thousands of years people have been pairing wine with cheese, which shouldn’t come as a surprise – it’s a delicious combination, with a mix of flavours you’ll be savouring on your palate long after you’ve swallowed every last drop. There’s been much debate over why we love combining this specific type of alcohol with this particular dairy-based food, with some people saying the reasoning is scientific, while others argue it’s cultural. However, the scientific explanation is actually quite interesting. According to a paper published by the journal, Cell, back in October of 2012, Paul Breslin, an experimental psychologist at Rutgers University, found that astringent and fatty foods (wine and cheese) oppose each other to create a balanced mouth-feel. According to Breslin, astringents (chemical compounds, such as the tannins in wine) make the mouth feel dry and rough. On the opposite side of the spectrum, cheese, which has a fatty and somewhat oily texture, lubricates the mouth, making it feel almost slimy. When consumed in isolation, neither of these feelings are particularly pleasant, however, when consumed together, the astringents in the wine will reduce the lubricant-like quality of the cheese, restoring balance to your palate. While wine is only mildly astringent, continued exposure to its tannins will increase its ability to balance the fattiness of the cheese. 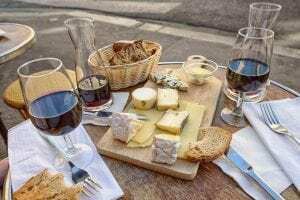 Essentially, what this means is that wine and cheese pair well together because high fat, high protein foods balance the taste of tannins, and vice versa. Since this study was published almost five years ago, countless other researchers have put this theory to the test. Having arrived at a similar conclusion, a group of scientists from the Centre for Taste and Feeding Behaviour in Dijon, France tested four popular French wines, with four types of cheese. The 31 wine tasters who were tested all arrived at the same conclusion – the cheeses enhanced their experience of the wine, by decreasing the dry mouth-feel. So, we can now safely say, with the certainty of science behind us, wine and cheese is absolutely delicious! If you want to experience the distinct flavours of the Yarra Valley first-hand, contact the team at Australian Wine Tour Co today! Our scenic tours will take your tastebuds on a trip around the world; all while you soak up the beauty and relaxing atmosphere of the Yarra Valley. To taste some of the region’s delicious farmhouse cheeses, consider taking off on our Private Premium Tour, which can include a trip to the Yarra Valley Dairy, the home of handmade Victorian cheeses.